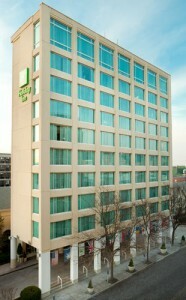 The Holiday Inn Ithaca is the best place to stay while attending LVI 2012. Centrally located near the Ithaca Commons, the hotel features free shuttle service to campus and the Ithaca airport, and offers amenities such as free, high-speed wireless Internet access, 24-hour business center, on-site health and fitness center, heated indoor pool, and a full-service restaurant and bar. Plus, you’re just steps away from the shops, fine dining, and entertainment on the Ithaca Commons, our famous pedestrian mall. We’ve negotiated a special rate that includes a full American breakfast each morning and free motorcoach transportation to all conference events. There are a limited number of rooms available and they will fill up fast, so make your reservations right away. Room rate: $159 per night, includes All American Breakfast Buffet each morning from 6:30am-8:30am in a private banquet room. Please indicate how many will be staying per room, and mention the Special Rate Code: “LVI.” Book Online or phone: 1-607-272-1000. We’ve also reserved small blocks of rooms with special rates at these other fine Ithaca hotels. Be sure to mention the Special Rate Code when making your reservation. Free motorcoach transportation will be provided between these hotels and all conference activities on the Cornell campus.